TDmonthly - Q&A With Matthew Hiebert from Aroundsquare Ltd.
Q&A With Matthew Hiebert from Aroundsquare Ltd.
TDmonthly loves hearing the stories behind the toys. So, we were excited to speak with Matthew Hiebert from Aroundsquare Ltd., the creator of the wooden block toy Twig. Below, Hiebert shared with TDmonthly how his company got its start, how they are giving back to the global community, and why he thinks play is so important for kids. A. I've always been a maker, and I've always loved toys, so looking back, there's no surprise there. As a little kid I made a lot of crafts, and I loved science…but I didn't want to be a scientist. I wanted to find a way to make a positive contribution to something somewhere--at that time it was pretty vague. I never thought I would end up in the education field, but I was paying my way through school by coaching swimming, and loved it. After a couple of years I had an epiphany. I went into teaching and never looked back. As a teacher, I would often put together arts and crafts projects with my students that would demonstrate some kind of scientific principle in the form of a toy. Toys and playfulness more generally have always been a part of my identity. A. It's hard to say what my first "product" was. When I was a kid in school I would sometimes make things and sell them to my friends, strange little designs for skill toys, inspired by my passion for yo-yos. My entry point to the grown-ups' toy industry was a skill toy I call Monkey Knuckles (MK). I stumbled onto the design for MK when I was messing around with some materials trying to recreate a toy that one of my students had brought in to school. That toy was Astrojax, and when I got in touch with its inventor, he was very encouraging of my new design. His friends at the firm Active People were good enough to invite me to the New York Toy Fair that year. While I have not yet brought MK to the market officially, those early experiences taught me that the toy industry is accessible. There are very few real barriers to entry, and the people inside are good, genuine people. A. I tend to design things on paper, and I like wood because it is so forgiving and so easy to work with. I got my start selling my hand-made toy designs on Etsy.com. 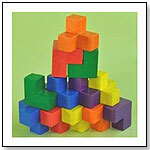 My first commercial success was a set of wooden blocks I dubbed Twig. One of my earliest customers bought a set of Twig, and liked it enough to write a review of the product on a parenting blog. Word got around, and a short while later I found myself negotiating a licensing agreement with Fat Brain Toys! The story of Aroundsquare's Goodwood Deconstruction Blocks is a little bit more linear. When I came up with that design, I was working in China on a bilateral education project. I was fortunate to be living in close proximity to a number of small workshops, and the full range of manufacturing options are just that much more accessible there. After fashioning my own early prototypes of the goodwood designs, I began commissioning one-off professional samples, and eventually went on to real manufacturing. Aroundsquare is still relatively small, and we continue to work in small batch production. Our products are all handmade and individually checked, at a small and ethically run factory in southern China. A. In my day job, I work in the field of international development, which has provided me the opportunity to make donations of toys to a wide range of schools and childcare facilities in countries like Bangladesh, Mongolia, China, and Egypt. Last year, Aroundsquare provided nearly 1000 sets of blocks to kindergartens and nursery schools in rural Egypt. Aroundsquare doesn't have a history of working with large charitable organizations. I much prefer the more personal approach where there is a real connection to the places where the toys end up. But I like to think that Aroundsquare goes well beyond the idea of charity. Aroundsquare is a social enterprise, and we hold ourselves accountable to a triple bottom line--people, planet, and profit, in that order. A. I tend to focus the donations in places where I am working. Convenience is a factor, but more importantly it is about making a personal contribution above and beyond the education consulting work I get paid to do. Since I work in the education field, and Aroundsquare's toy designs are so developmentally oriented, it is a great fit. In the case of Egypt, for example, I was managing an early childhood education project there at the time. Part of the project involved working with local NGOs to help open new kindergarten classrooms, and another component of the project related to the development of a progressive play-based national kindergarten curriculum. It was a perfect complement. A. I've done quite a bit of volunteering domestically, in both environmental organizations as well as community groups. Since my day job focuses on international development, I try to keep a balance by contributing locally when the right opportunities present themselves. A. Accomplishments are things we look back on, and I still feel like I'm just getting going! Aroundsquare started out with quite a splash - Fat Brain Toys saw to it that Twig, our first product to come to market, had an exclusive launch at the gift shop of the Metropolitan Museum of Art. Twig went on to win a bundle of awards in its first year. My greatest satisfaction these days is seeing Aroundsquare growing steadily, with an expanding range of designs. There are more great things in the pipeline, and I can say with confidence that the greatest accomplishments are yet to come! A. I think that the value of real open-ended creative play is under-recognized. So many toys aim to entertain or educate or otherwise occupy (in the colonial sense) children's minds. Those kinds of toys put the child into a passive role, following instructions or trying to achieve a singular goal. This may have been appropriate to industrial-era education and child development. It helped to develop the cogs in the big social and economic machine. Today, there may still be a place for that kind of play, but it definitely shouldn't be the only thing. Good citizenship in our context requires much more than servility, and toys have an important role to play in helping the child develop autonomy. At Aroundsquare, we believe it should be the child that plays with the toy, not the other way around…the child should be in charge of the relationship! Aroundsquare's motto, "play today: build tomorrow" captures the spirit of what I hope for. If we give more space to the child, if we don't tell them what to do or how to do it, they are confronted with freedom and ambiguity, and they are incredible little beings in how quickly they rise to the challenge! They begin to form their own ideas, develop their own ways to play. This can be a fundamentally empowering experience. I see a really clear connection between this kind of play and the development of the kind of citizens we need to meet the challenges that lay ahead. Twig by FAT BRAIN TOY CO. When precision wooden shapes and vibrant color meet, expect nothing less than masterwork. Twig features natural wood, carved with care and colored with brilliance. Light plays its way through the windows of Twig - illuminating lines, contours, space and arrangement, opening the mind and imagination to new exercises in visual spatial development. Each Twig set consists of 72 wooden pieces; all are compatible with one another. The interactivity between components means limitless combinations in open-ended play. Launch date: February 2009. This set consists of 6 blocks Goodwood deconstruction blocks are a new system of innovative wooden blocks, designed to invite real creative play. The beautiful, precisely crafted blocks are intentionally packaged without instructions or other prescriptive guidelines, in order to cultivate open-ended exploration. Unlike most modern toys, this puts the child in complete control of the child-toy relationship, and encourages them to come up with their own ways to play. The different shapes allow for building outwards in every dimension, and the creation of structures which are both architecturally and geometrically interesting, as well as visually pleasing. They are suitable as a construction toy for children, and increasingly popular as a desk toy for design-minded adults as well. The ever-growing goodwood system currently includes seven original designs. Each set is designed to be fun and interesting on its own, and to provide new features when combined with the other sets as well. All sets come with pieces in six vibrant colors (water-based acrylic paint), made from forest-friendly rubber wood, and CPSIA tested. Care has been taken to ensure that the product reflects responsible social and environmental decision-making, and the developer's website provides a mechanism for purchasing discounted sets for donation into orphanages and kindergartens in the developing world. 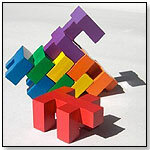 Goodwood deconstruction blocks are a new system of innovative wooden blocks, designed to invite real creative play. The beautiful, precisely crafted blocks are intentionally packaged without instructions or other prescriptive guidelines, in order to cultivate open-ended exploration. Unlike most modern toys, this puts the child in complete control of the child-toy relationship, and encourages them to come up with their own ways to play. The different shapes allow for building outwards in every dimension, and the creation of structures which are both architecturally and geometrically interesting, as well as visually pleasing. They are suitable as a construction toy for children, and increasingly popular as a desk toy for design-minded adults as well. The ever-growing goodwood system currently includes seven original designs. Each set is designed to be fun and interesting on its own, and to provide new features when combined with the other sets as well. All sets come with pieces in six vibrant colors (water-based acrylic paint), made from forest-friendly rubber wood, and CPSIA tested. Care has been taken to ensure that the product reflects responsible social and environmental decision-making, and the developer's website provides a mechanism for purchasing discounted sets for donation into orphanages and kindergartens in the developing world. Goodwood is a system of innovative wooden blocks, designed to invite imaginative and creative play. The precisely crafted blocks allow for building in every dimension, creating structures that are architecturally interesting and visually pleasing. The system includes seven intercompatible sets, each intended to be fun and interesting on its own, and to combine in fascinating ways with the others. These colored blocks are made from forest-friendly wood and are CPSIA tested. 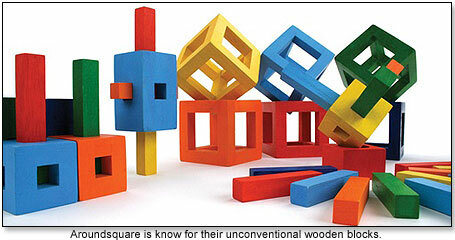 "The abstract, innovative shapes of the Goodwood blocks, which fit together in surprising and interesting ways, cultivate truly open-ended explorative play," Around Square President Matthew Hiebert told TDmonthly. •Will Online Shopping Follow the Path of Catalogs? •Hot or Not? 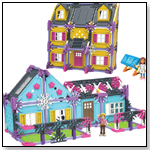 2013's Toy Trends...According to Specialty Retailers! •Toy Fair 2013 - To Go, Or Not To Go? •Q&A With Matthew Hiebert from Aroundsquare Ltd.